Stop number three on the Chinatown hand-pulled noodle shop tour: Eastern Noodles. This family-run noodle shop relocated to Forsyth from just around the corner on noodle (and dumpling)-rich Eldridge Street. Though still Chinatown-utilitarian, the decor of this newest outpost is just slightly brighter and perhaps a little cleaner than the others. The Times Peter Meehan wrote up this little place in 2005, in a piece from which I lifted the title of this blog entry. Like him, we put in our order for bowls of beef with hand-pulled noodles and sat back to watch the show. A man — the owner, Lanzhou-trained Jianbin Gao — measured out a wad of dough and went to work, stretching and pulling the dough into increasingly thinner strands. 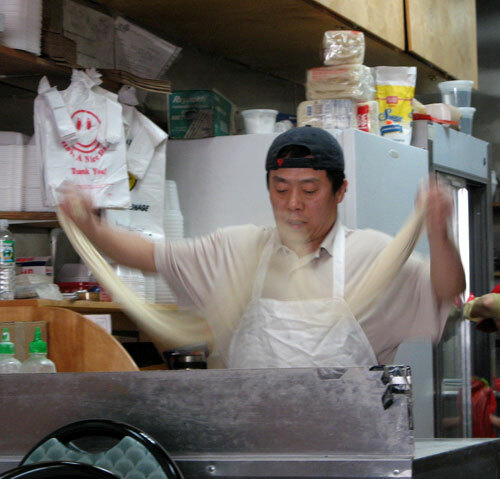 The noodles twirled and flipped through the air in his expert hands, intermittently slapping against the floured counter. According to the Times, Gao and his wife opened the original noodle shop in 2001 to follow one they had operated for a decade in Fujian before moving to the United States. 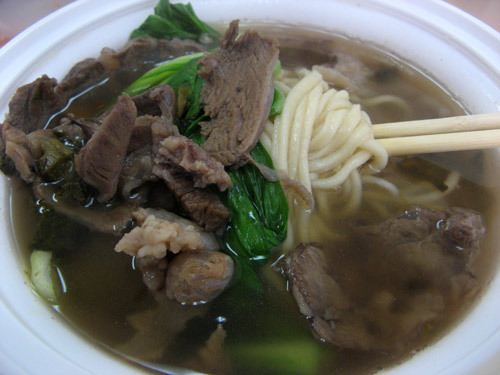 Gao made short work of the dough, after which his wife took over, dunking the noodles into a vat of broth deeper inside the kitchen, and topping our bowls with a pile of beef and greens. (White, take-out plastic dishware seems to be standard issue among these shops.) The texture of the noodles was delightful — firm and just chewy enough, as they would remain to the last strand. The soup broth was fine, too, but to my tastebuds, fell just short of the richness of Sheng Wang’s, for which we compensated with a generous — perhaps too generous — spoonful of chili oil from the table. 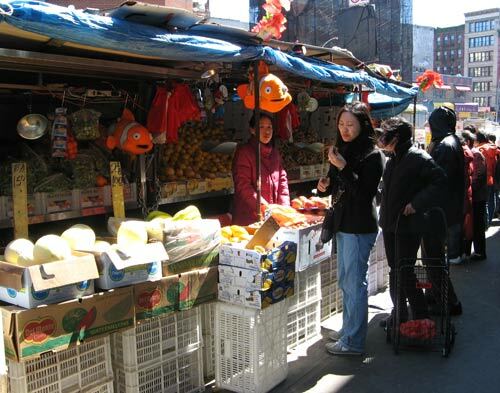 On a sunny, but slightly chilly Spring day, I came across this busy vegetable market on Forsyth Street in Chinatown, literally in the shadow of the Manhattan Bridge. Terrific selection and perfectly ripe produce, at a fraction of the price it would command just a couple of subway stops uptown. 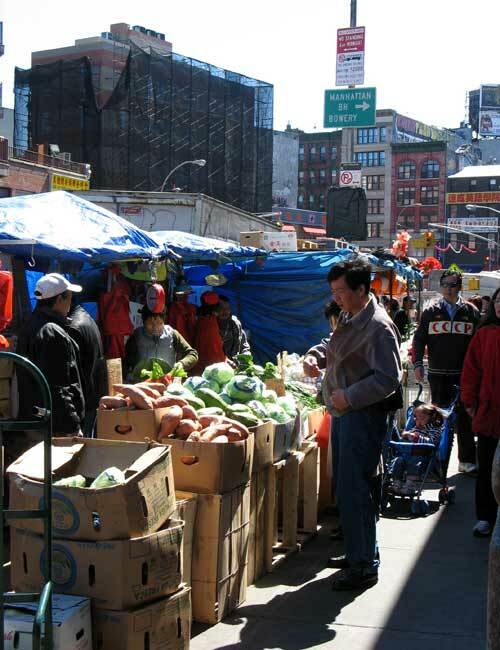 Earlier this year, SYB clued me into a fascinating NPR feature investigating how it is that Chinatowns around the country are able to offer produce at prices so much lower than mainstream outlets – and in some cases, lower even than wholesale sources. The conclusion: shoppers in these areas typically buy produce more frequently, and primarily for use the same day, so only buy when the fruits and vegetables are at the point of ripeness, i.e., the very point at which the distributors are most desperate to unload their supply, and are therefore most willing to offer deep discounts. By contrast, larger-volume urban/suburban outlets (e.g., chain supermarkets) want produce with shelf life to allow for the largest window of salability. In addition, the larger chains need to maintain a more or less constant supply and variety of stock; smaller makeshift outlets like the street vendors are able to absorb last minute items and in smaller quantities, since they are generally not expected to maintain the same stock supply from day-to-day. Shopping this way requires more flexibility from the buyer, but the trade-off can be tremendous value. It’s a tough way to earn a buck, though. 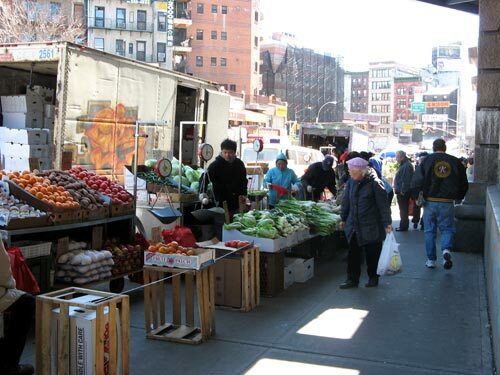 A 2002 New York Times article offered a glimpse into the vendors’ lifestyle: rising before dawn to spend hours scavenging for leftover produce at places like the Bronx’s Hunts Point Terminal Market. One vendor interviewed for the article described standing in the cold all day, to earn a pitiable $30.00. Meanwhile, city officials pressure the often-unlicensed workers for clogging the streets and attracting vermin in their wake. And sure enough, by the time I walked by this street just an hour later, all these vendors were packing up their crates (and any hopes for a profitable day) under the glaring, watchful eye of the NYPD.